The DR-Pro rope hoists meet all requirements for state-of-the-art hoists to satisfy tomorrow's needs. Besides their space-saving design and particularly long service life, they also offer high lifting speeds for faster handling rates. Comprehensive standard features provide excellent value for money. Available in four basic designs, our DR-Pro rope hoists provide the right solution for virtually any application. 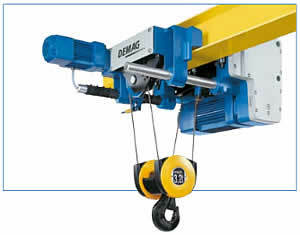 EKDR hoists with a trolley optimised for crane applications feature a compact design and minimum approach dimensions. Low-headroom EZDR double-rail crabs can also be used in applications where space is at a premium and are rated for loads weighing up to 50 tonnes. FDR foot-mounted hoists are suitable for universal applications and are prepared for direct connection in four mounting positions.